Neva is different. Aside from having a phobia of mirrors and an unquenchable desire for apples, she harbors a dark secret. She's been cursed to repeat the same three years of her life over and over again. Unfortunately, these three years happen to be Neva's sophomore, junior, and senior years of high school, and high school's not that easy when everyone considers you a freak. To break her curse, Neva must accomplish a grisly task that she can't bring herself to complete. Will Neva break her curse in time, or will she be bound by it forever? I am an avid reader of anything to do with fairy tales, especially if it is a retelling. Needless to say this book caught my eye from the start. I could tell from the summary that it was going to have to do with Snow White. I don't care for the original tale but I've really enjoyed some of it's retellings so I was hoping this would be another to add to my list of retellings. 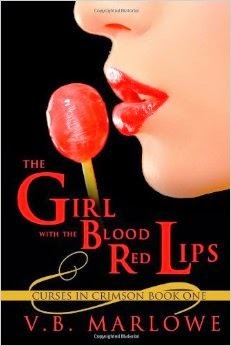 The Girl with the Blood Red Lips starts out slowly and at first glance it looks like it will be another one of those 'high school' books that features on the outcast leaving her group of friends to join the popular crowd. This story comes with the twist of it having witches and cursed princesses however and things really start to heat up in the second half of the book when a few characters turn up murdered. Neva dosen't feel at all like the usual snow white character. In fact aside from her refusal to break her curse she isn't very snow white like at all. She's almost a flat character who doesn't argue much and is easily swept up in the politics and flow of High School. You'd think that after 200 years of dealing with it she'd have a better grasp of what it's like to be in High School, and while she says she does I don't see it in the book. Her best friend feels very typical in her role and doesn't have much to her except to be a device to move the story forward. In fact the only character who really intrigued me at all was Henry the boy next door who we never see. Literally. Until the end of the book both the reader and Neva only hear his voice. The story is interesting and I would have liked to see it focus a little more on Neva's curse and the fairy tale aspect of her life, but we mostly get school politics and the occasional trip to the fair. As I said earlier it moves slowly in the first half and then begins to pick up momentum later on. Things really started to get interesting for me when more cursed characters began to show up and we got to know a deeper detail about Neva's curse and what it takes to break it. Romance is an interesting subject in this book, seeing as Neva's curse prevents her from really having true relationships altogether. I enjoyed the fact that she didn't need a knight in shining armor or a prince to save her along with the fact that the romance in the book wasn't sappy or overdone. Her reaction's to wanting attention from a boy and dealing with the fact that she could never truly have it were written well and felt real. The ending wraps up well giving us a good ending to Neva's story while simultaneously giving us a hint at what is to come next. The reader could choose to not read the rest of the series and be happy with this ending or they could be excited for the next book. The book was good with an intriguing premise, it was creative, and a great place to go after the story of Snow White, but it just didn't do it for me. I think it will be interesting to see where the author goes next. I liked it and I didn't. I may or may not read the next book. I would recommend it to someone who needs something to read, but don't count on it knocking your socks off. Note: I received a free copy of this book from NetGalley for my fair and honest review which I have stated above.